Is your company looking to recruit a diversified workforce (women, members of minority groups, and people with disabilities) through print or website advertising? 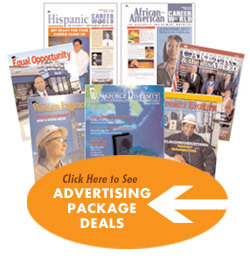 EOP offers several online advertising opportunities. Attract a diversified workforce thru banner advertising, online display ads or by placing job postings on EOP's Job Board (Diversity & Inclusion Career Center).